A fault may occur in an electric motor due to various reasons. In an Engineering plant, Electric Motors are mostly used to drive the Air Compressor. Electric Motors are mainly two types one is “AlterNet Current” (AC) and other is “Direct Current” (DC) Motors. The fault may occur in each one of them. AC Motors are used in Air Compressor unit. Sometimes these Electric Motors are also giving trouble and total compressor unit stops, resulting in plant shutdown. Hence to avoid this, you have to take due care of your total Air Compressor unit along with Electric Motor. 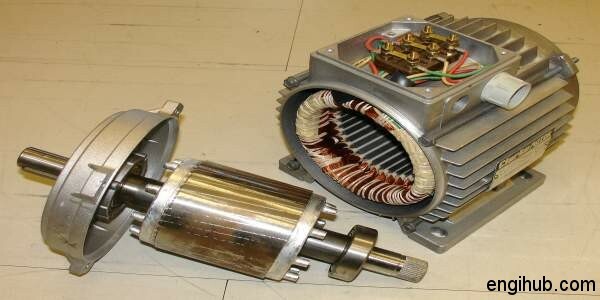 This post will gain your information about faults occurring in Electric Motor. So, you can protect your Air Compressor unit from stopping to perform. I will try to cover all most all faults so you can rectify it as early as possible and minimize your shutdown time of plant operations and Air Compressor. Reason :-( 01) No supply voltage, one phase open, incoming voltage is too low. Rectification :-( 01) Check voltage on each phase. Reason :-( 02) Motor may be overloaded or control gear (Starter) defective. Rectification :-( 02) Reduce load, start uncoupled from the load. Examine each step of the control gear (Starter) for bad contact or open circuit. Make sure that brushes are making good contact with the slip-rings. Reason :-( 03) Rotor defective, Mechanical locking in bearings or an air gap. Rectification :-( 03) Look for broken rings or clean air gap if choked. Reason :-( 01) Power failure. Rectification :-( 01) Check for loose connections to a line, to fuse and to control. Reason :-( 02) Overload on the motor. Rectification :-( 02) Examine Overload trips. See that they are set correctly. See that Dash-pot is filled with correct grade and quantity of oil. Reason :-( 01) Motor Overload. Rectification :-( 01) Reduce load. Reason :-( 02) Low Incoming Voltage. Rectification :-( 02) Ensure that the incoming voltage required as per nameplate is maintained. Reason :-( 03) Open Circuit. Reason :-( 04) Incorrect control resistance of Wound Motor. Rectification :-( 04) Check, control sequence, replace broken resistors. Repair open circuit. Reason :-( 01) Voltage too low at motor terminals because of line drop. Rectification :-( 01) Apply correct voltage as per nameplate. Use correct size of cable. Reason:-(02) If wound rotor, improper control operation of secondary resistance. Rectification :-( 02) Correct rotor control and connections. Reason :-( 01) Applied voltage is too low. Rectification :-( 01) Improve voltage up to requirement. Reason :-( 02) Excess loading. Rectification :-( 02) Reduce load on the motor if it is overloaded. Reason :-( 03) Poor circuit. Rectification :-( 03) Check for high resistance. Reason :-( 04) Defective Squirrel/Cage rotor. Rectification :-( 04) Replace with the new rotor. Reason :-( 01) Check load. Rectification :-( 01) Reduce if overloaded. Reason :-( 02) Wrong blowers and air shields may be clogged with dirt and prevent ventilation of motor. Rectification :-( 02) Good ventilation is manifest when a continuous stream of air leaves the motor. Reason :-( 03) Motor may have one phase open. Rectification :-( 03) Check to make sure that all leads are well connected. Reason :-( 04) Grounded coil. Rectification :-( 04) Repair as early as possible. Reason :-( 05) Unbalanced terminal voltage. Rectification :-( 05) Check for faulty leads, connection, and cables. Reason :-( 06) Faulty connection. Reason :-( 07) Rotor rubs stator. Rectification :-( 07) If not poor machining, worn/defective bearings. Reason :-( 01) Wrong phase sequence. Rectification :-( 01) Reverse connection at motor terminals or switchboard. Reason :-( 01) Motor misalignment. Rectification :-( 01) Realign electric motor and air compressor. Reason :-( 02) Foundation nuts of electric motor or compressor may be loose. Rectification :-( 02) Tighten all the foundation bolts of a motor and air compressor. Reason :-( 03) Wound rotor coil replaced. Rectification :-( 03) Rebalanced rotor. Rectification :-( 04) Check for open circuit. Reason :-( 04) Motor running for single phase. Reason :-( 01) Unequal terminal voltage. Rectification :-( 01) Check lead and connection. Reason :-( 02) Single phase. Rectification :-( 02) Check for open circuit. Reason :-( 03) Poor rotor contacts in control wound rotor resistance. Rectification :-( 03) Check and rectify. Reason :-( 04) Brushes not in the proper position in wound rotor. Rectification :-( 04) See the brushes are properly seated. Reason :-( 01) Fan rubbing air shield. Rectification :-( 01) Remove interference. Reason :-( 02) Fan striking insulation. Rectification :-( 02) Clean fan. Reason :-( 03) Loose on a base plate. Rectification :-( 03) Tighten holding bolts. Reason :-( 01) Air gap not uniform. Rectification :-( 01) Check and correct bracket fit bearings. Reason :-( 02) Loose bearings. Rectification :-( 02) Correct or renew. Reason :-( 03) Rotor unbalance. Rectification :-( 03) Balance the rotor. Reason :-( 01) Motor may be overloaded. Rectification :-( 01) Reduce the load if overloaded. Reason :-( 02) Brushes may not be of correct quality and maybe sticking in holders. Reason:-(03) Brush pressure may be too light or too much. Rectification :-( 03) Adjust brush pressure correctly. The values are 0.15 to 0.20 kg/cm² brush area. Reason :-( 04) Slip-ring may be rough, dirty or oily. Rectification :-( 04) Clean the slip-rings and maintain them smooth glossy and free from oil and dirt. Reason :-( 05) Slip-ring may be ridged or out of trueness. Rectification :-( 05) Turn and grind the slip-rings on the lathe to smooth finish. So, as per my knowledge, these are the maximum faults may occur in Electric Motor. Many faults and its rectification are disclosed. Still, some important fault may left. I will try to cover all the fault so maximum knowledge you have, regarding troubleshooting of Electric Motor. It is also possible that you may find any other problem which is not covered here if this happens please add a comment, other will also be benefited.